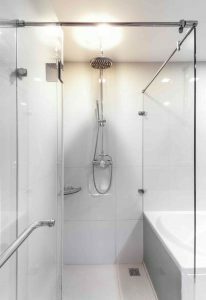 It’s easy to overlook some of the common mistakes that a lot of people make in the shower and understanding how to change them will put you on a path to having a better bathroom. Some habits are hard to break, but if you get a better picture of how your habits are negatively affecting your bathroom, then it will be easier for you to make some much-needed changes. It’s easy to overlook some of the common mistakes that a lot of people make in the shower and understanding how to change them will put you on a path to having a better bathroom. Check out these tips to break those bad shower habits. As luxurious as this sounds and feels, long showers with the heat turned all the way up will cause problems in your bathroom. They will cause your skin to be dry, itchy, and itchy after you get out and foster the growth of mold in your shower or bathroom. If possible, make sure that your bathroom is properly ventilated by opening a window or even the door to your hallway or bedroom. Try to keep showers to about 10 minutes with the water at a moderately warm temperature. One of the worst conditions for your plumbing is allowing hair and other debris to wash down the drain and accumulate in your pipes. Too much hair will ultimately create blockage in your pipes, which will lead to even bigger problems than just a slow drain. To combat this issue, invest in a drain cover or another type of drain stop that will allow you to remove hair from the shower to be discarded in the trash. Leaving your loofah in the shower isn’t the best place to store it. Imagine the environment that the moist, warm shower creates for your loofah. It allows bacteria to grow and attach to your loofah, making it an unhealthy shower accessory to use. Moving forward, after you get out the shower, remember to grab your loofah, ring it dry, and keep it in a place where it will remain dry until the next time you’re ready to use it. This entry was posted on Friday, December 22nd, 2017 at 9:03 pm. Both comments and pings are currently closed.